She knows everything about you and loves you like crazy. She is your mother. There is a creature on this planet who doesn’t care about herself, she only cares about others, especially, for her children. You know what we call that creature? We call her ‘Mother’ or ‘Maa’. It’s very difficult to express what mother’s love is in few words. Her heart is full of love, forgiveness, kindness and lot of care for you. Her prayers are the strongest thing in this world that always follows you to help and improve your life. Her love knows no law – she protects you from every obstacle that stands in your path. No one worries about you like your mother, without her, you feel unsafe. She is a teacher of love, fearlessness, and compassion. She always encourages you to be a good man/women. She is a perfectionist, unselfish and a wonderful creature. Her love can’t be described in words. She knows everything about you. In this poem, I’ve tried to present the amazing role that a mother plays in every person’s life. Her sacrifice and love for her children are unconditional. If you love your mother, please share this poem and dedicate it to your sister, wife, grandma, aunt or a friend who is a mother. Best poem I have ever read on mother. TUMNE BAHUT JYADA RULA DIYA. 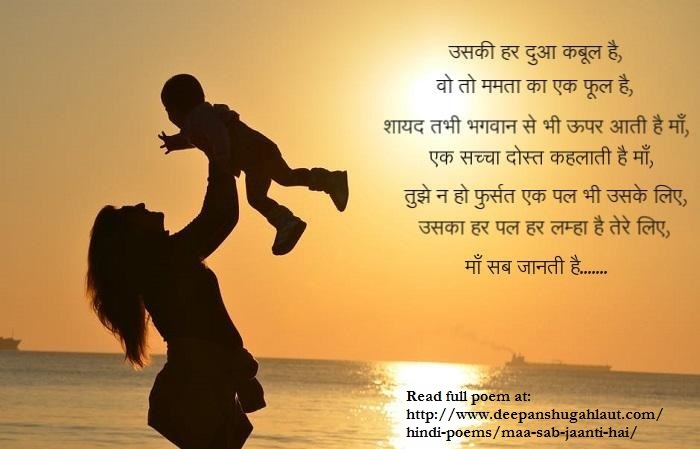 I love you maa so best poem!